Usually 10-12 cm long may be up to 20 cm long. 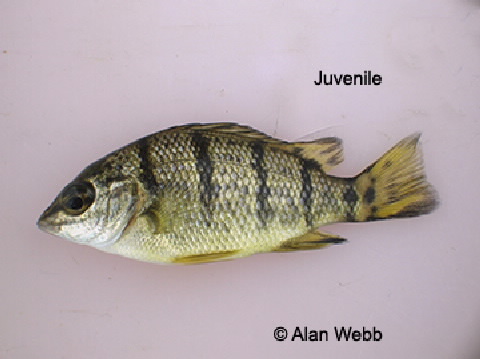 This fish is widespread in the tropics where it can be found in pools and in fast-flowing streams. It can be aggressive when confined to a small space. Males and females similar in size and appearance. The body is silvery-grey or even yellowish with vertical dark bands, some darker spots are scattered along either side between the bands. The fins are clear to yellowish, some brownish patches are present; lower lobe with a black edge. It is an omnivore, feeding mainly on aquatic and terrestrial insects, algae and aquatic weeds as well as snails and occasionally small fish.